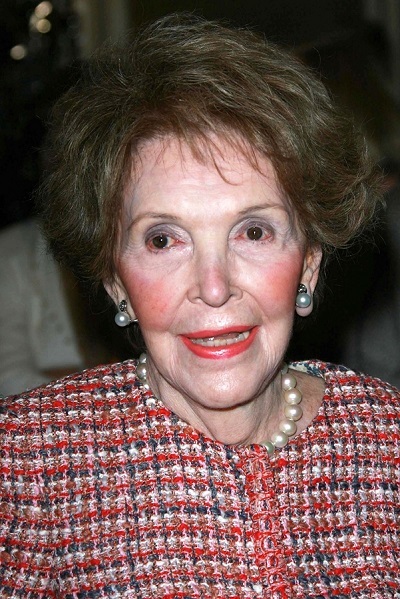 Place of Birth: Manhattan, New York City, New York, U.S.
Place of Death: Bel Air, Los Angeles, California, U.S.
Nancy Reagan was an American actress, usually credited under the name Nancy Davis. She was the First Lady of the United States (1981-1989), as the wife of the 40th President of the United States, Ronald Reagan. She was previously First Lady of California (from 1967 to 1975). Ronald and Nancy co-starred in one film together, Hellcats of the Navy (1957), playing love interests. They two children together, radio host and political analyst Ron Reagan and actress and author Patti Davis. Nancy was the daughter of Kenneth Seymour Robbins, a car salesman, and Edith Luckett, an actress (born Edith Prescott Luckett, also known by her married name, Edith Luckett Davis). She took on the surname of her stepfather, Loyal Edward Davis, a neurosurgeon, becoming known as Nancy Davis in her early years. Nancy was of English descent. Many of her ancestral lines have been in the United States since the 1600s. Nancy’s paternal grandfather was John Newell Robbins (the son of Edward Newton Robbins and Emma/Emily Barnes). John was born in Massachusetts. Edward was the son of John Newton Robbins and Elizabeth Mercy Seymour. Emma was the daughter of James Newell Barnes and Charity Ives. Nancy’s paternal grandmother was Ann/Anne/Annie Ayers Francis (the daughter of Frederick Augustus Francis and Jessie Ann/Anne Stevens). Nancy’s grandmother Ann was born in New York. Frederick was the son of Manning Francis and Elizabeth Robbins Root. Jessie was the daughter of Joel Stevens and Jessy Ayres. Nancy’s maternal grandfather was Charles Edward Luckett (the son of Thomas Luckett and Sarah Ann Taylor). Charles was born in Maryland. Thomas was the son of Joseph Lockett. Sarah was the daughter of Henry Moore Taylor and Nancy Addison. Nancy’s maternal grandmother was Sarah Frances Whitlock (the daughter of Edward F./H. Whitlock and Martha A. Wells). Sarah was born in Virginia. Edward was the son of John Whitlock and Sarah. Third link is totally wrong. I am glad that you check the link I post. I added a Trump’s mother accurate genealogy and more stuff about Jean Louis Trintignant grandson. Have a look. However for such an important American figure there’s a lack of depth on her mother’s side. She also had Scots-Irish/Northern Irish, French, Welsh, and Irish ancestry. Do you really want to ruin a simple notation by adding ancestors who were all born before the year 1630? I’m not sure about some of the others, but John Thomas Leonard’s maternal grandparents, at least, were of English origin (his maternal grandmother was even a “Warburton”, like your submission). BTW, geni.com sometimes fudges it when it comes to these old 1600s ancestors. I forget the name now, but they listed a Native American ancestor for George Clooney in the 1600s. When I checked it, they got the connection wrong on two different occasions right before that ancestor. There was another one, or maybe two, I’ve checked in the last few weeks that had similar errors. Okay, I’ll make sure to use 1600 as a sort of limit from now on. I’ve put up information on Joey Feek, by the way. I’d have considered to include the Frenchman in the ethnicity box, considering he was a Maryland colonist who died in U.S. The others didn’t even live in New World. ENGLISH is good. Simple !